California station opened as the western temporary terminal when the Lake Street Elevated first began regular passenger service at 5 am on November 6, 1893. 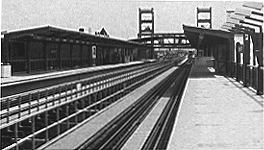 As more stations were completed, service was extended west. Designed by the Railroad's engineering staff, the station was an iron structure that represented a unique attempt to apply the Queen Anne architectural style, more typical of wood or brick houses, to a elevated metal transit station. The station houses also presented strong influences from the High Victorian Gothic style, although the stations' construction in 1892 represented a late application of this style. The exteriors were clad in corrugated metal siding with decorative detail in the metal and wood trim around the windows and in panels below. Perhaps the stations' most identifiable features were the buildings' characteristic "pagoda"-like cupolas. Because the fare controls were at track level, this required two separate station houses per station: one per direction, connected to each platform. The interiors of these stations had floor to ceiling tongue-in-groove paneling and wood moldings, with a wood floor, peaked ceiling, circular windows on the walls at the peaks, benches along the walls, and wood-burning stoves in the center of the room to heat the station. The ticket offices in the Lake Street stations were on the trackside walls of the interior. The platforms had short canopies, covering just a few cars, which were actually extensions of the station house roofs. By the 1970s, the station was suffering from deterioration, resulting in vandalism and misuse. In July 1977, the eastbound station house fell victim to a fire and was subsequently removed. It was replaced simply by Plexiglas enclosures and partitions and a wooden agent's booth on the platform. 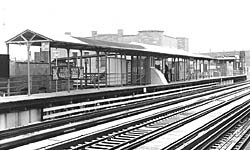 By 1980, the westbound station house was gone as well and replaced with a treatment similar to the eastbound side. The station retained a few of its original features, like its ornate canopies, but was otherwise of a simple, utilitarian design. California was closed in the service revision of February 9, 1992, chosen along with several other stations and auxiliary entrances because of its low ridership and availability of alternate transit options, to help balance the CTA's budget. Ironically, only a few years after closing as a result of low ridership, California was resurrected during the Green Line rehabilitation of 1994-96. There was intense political pressure to retain stops and this situation had the unusual result of the decision to replace a station that had been closed for poor performance and cost-recovery a few years before with an all-new facility. 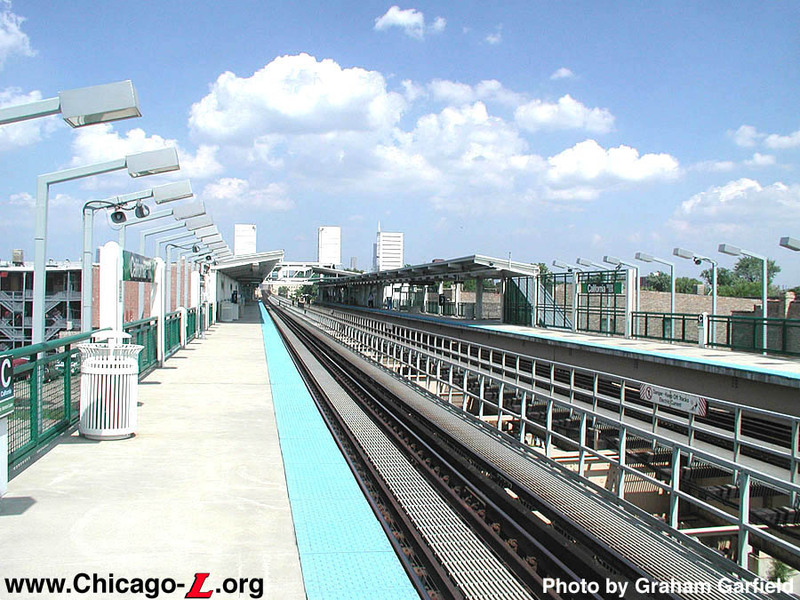 California's brand new design was developed by Skidmore, Owings & Merrill (SOM), who had been selected in 1993 as a lead architecture/engineering firm for the renovation of the stations along the Green Line. The new station was executed, at a basic level, following the "open plan" design. The new station house, located at track level, is constructed of white steel, large glass windows and green accents. 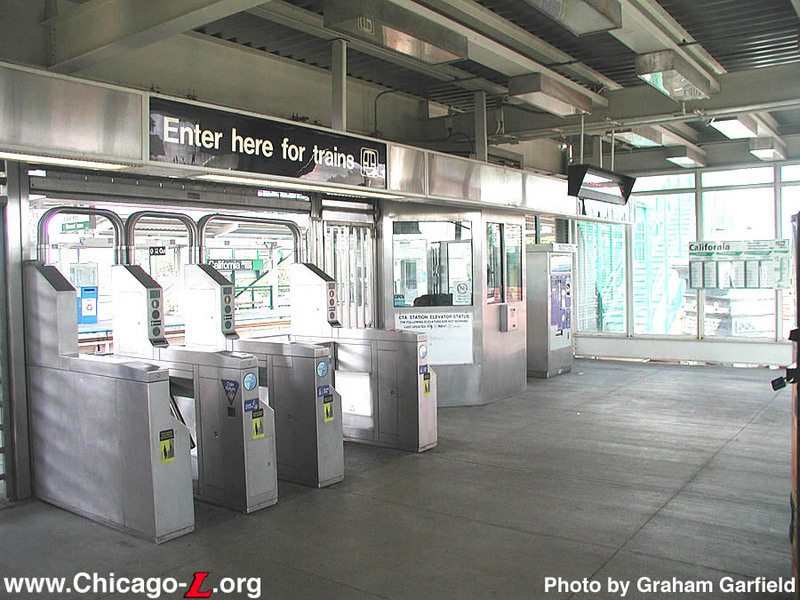 Unlike the previous incarnations of the station, only one fare control area was provided for the both directions, located at track-level on the south (inbound) side. 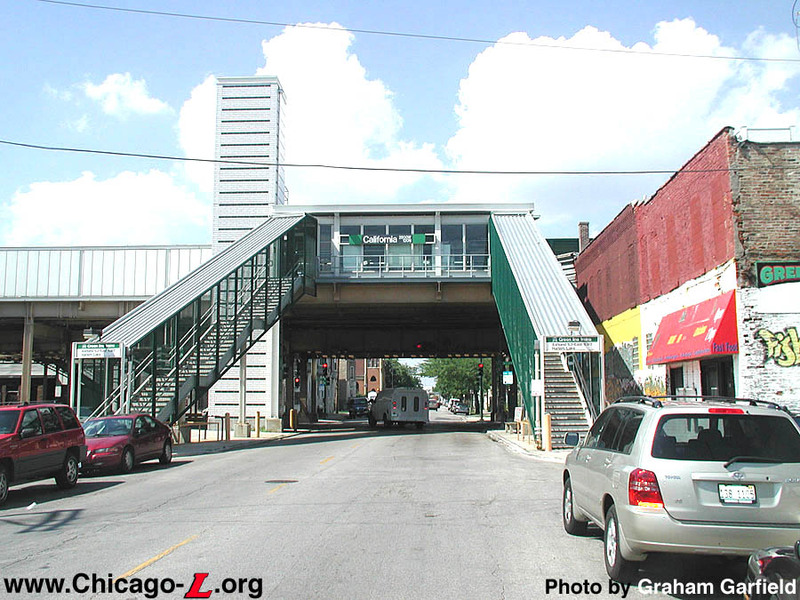 An elevator on the southwest corner of Lake and California, decorated in white tile with green stripes, stands ready to bring passengers to the station house. 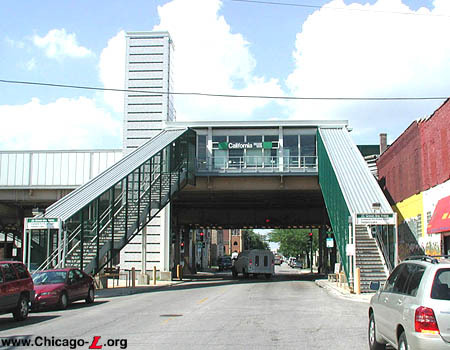 To access the outbound platform on the north side, riders must utilize another set of elevators east of the station house, connected over the tracks by an elevated bridge. 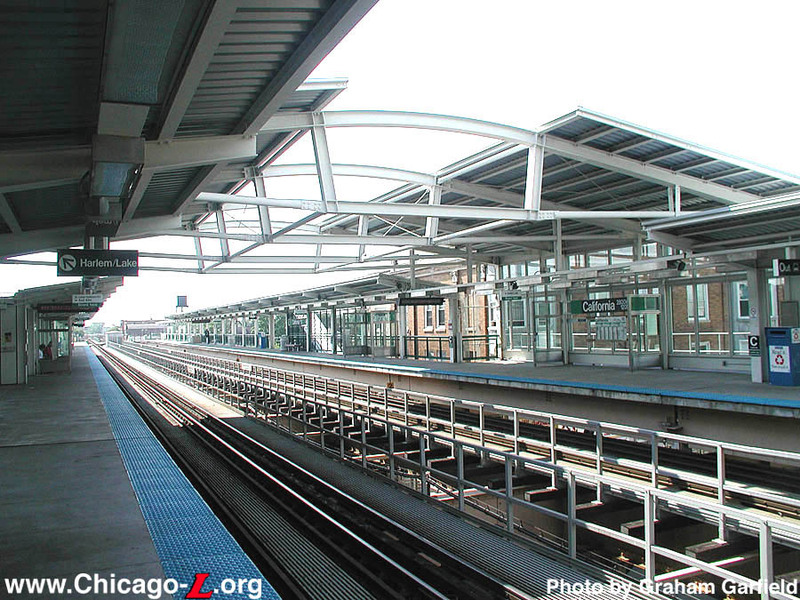 The canopy extends the entire width of the platforms, but unlike the horizontally flat canopies of many new "L" stations of the preceding decades, this one has a peaked roof with postmodern, unusual angled latticework in the center section. 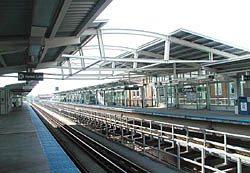 Because of construction delays, the new California station did not open when Green Line service resumed on May 12, 1996. Although the stop did open, it was operated with temporary facilities until the main fare control area was completed. The platforms were largely done in May, but the ticket agents were located in temporary wooden booths at the auxiliary exit stairs at Mozart Avenue, a block east of California. 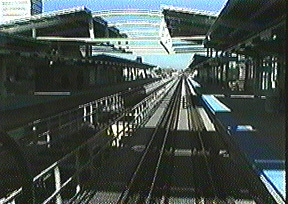 The station was officially dedicated on July 13, 1996 and the new station house and elevators came into use on August 5. At that time, the Mozart fare controls were removed and those stairs became auxiliary exit-only, as intended.